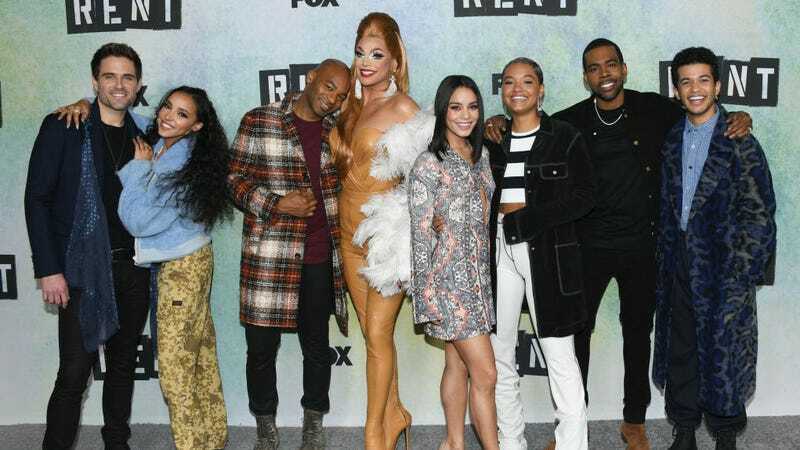 Although billed as Rent: Live, last night’s television production of Rent wasn’t exactly “live.” After Brennin Hunt broke his foot during Saturday’s dress rehearsal taping, Fox found itself facing a Sunday night airing that didn’t have either a) a Roger or b) an understudy to play the character. To compensate, the broadcast used Saturday’s footage and a live finale to sorta-kinda make good on the “live” half of the Rent: Live viewers were promised. While our review called what did air “an imperfect but heartfelt production of an imperfect but heartfelt show,” what the audience in attendance saw ended up quite different. Rather than simply air the dress rehearsal tape for the people who’d come out to see the musical, those gathered for the production were shown both the TV broadcast and a version of the live show with Hunt in a wheelchair. Director of photography Dylan Sanford describes the scene in a Twitter thread that makes it seem like the ad-hoc performance actually turned out pretty great. A number of clips from this version of the performance have popped up on Twitter, showing a take on the show that’s certainly a lot rougher around the edges, but makes up for it with tons of energy. Fox, perhaps noticing that smartphone videos of the unaired performance were flooding the socials, started releasing official footage, too. These clips, redundantly dubbed the “cast concert version,” show that there’s high-quality tape of the unaired performance hanging around at Fox. Here’s hoping it gets broadcast—or at least released in some capacity—at some point, lest we never get a truly live version of Rent: Live.